Everyone needs a moment to just kick back and relax and not think about the countless tasks that fill up their personal and professional lives. 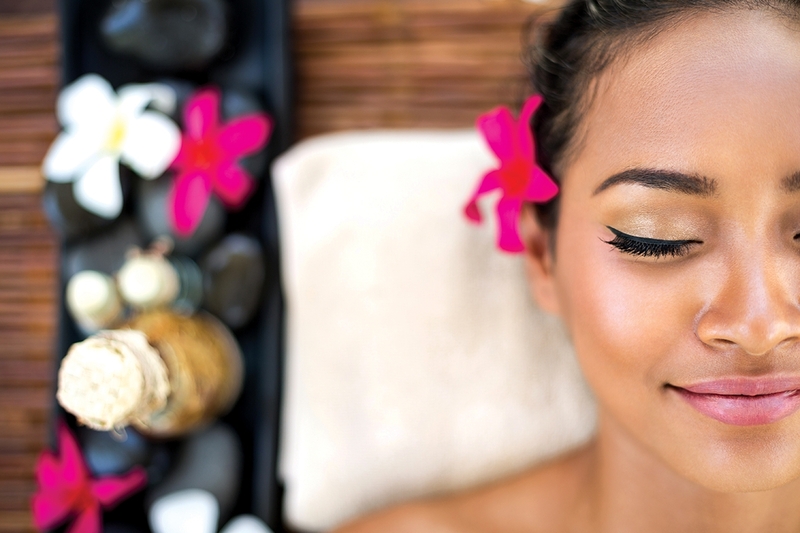 What better way to hit the pause button than by indulging in a bit of pampering? Connecticut is the perfect place to find a host of venues that offer individual services or full packages to help you relax and rejuvenate. At the Groton-based Home Salon & Spa, an hour is all that it takes to de-stress your body. Using organic French lavender, lavandin, and clary sage, your masseuse will incorporate the techniques of Swedish, deep tissue, acupressure, and foot reflexology in the Stress-Fix Body Massage. These harsh winter months can wreak havoc on your skin. To give your dermis the love it deserves, try the Dual Exfoliation Peel, which “combines Aveda’s naturally derived mechanical and biochemical exfoliation methods” to give your skin a lift. This non-invasive treatment will improve your skin’s texture and appearance, and leave you feeling refreshed. Can’t decide which part of your body needs the most attention? No need to choose. The SANNO Spa Trio with lunch provides clients with a 25-minute full-body exfoliation -- using lavender mint or green tea and lemongrass, followed by a shower, and lotion application. The package also includes a 50-minute Swedish massage and a 50-minute facial, the latter which focuses on “firming, calming, clearing, and brightening” the skin. Clients also receive a $25 lunch voucher for the Fresh Salt Restaurant. In honor of acclaimed actress Katharine Hepburn, who lived in the seaside town, clients can get the top-of-the-line treatment with the Woman of the Year package. A 75-minute Kate Rose Wrap calls for a “dry brush exfoliation, European Rose Clay Mud Wrap, face and head massage, shower, and Rose Crème finish,” a treatment that will leave your body feeling relaxed and refreshed. The next three hours is filled with maximum pampering. A facial, spa manicure, and spa pedicure round out the day. Clients also receive a $25 lunch voucher. The day spa packages at The Spa at Norwich Inn are available Monday to Friday, and combined with a lunch, can make for an enjoyable day. Interested in amping up the level of luxuriousness? Staying overnight, after spending the day being treated like royalty, only adds to the experience. The Quick Fix gives clients plenty of options. Try either a 50-minute massage or a renewal facial, and one wellness class of your choice, such as yoga, cardio, stretching, mindful meditation, or a strength training class. Clients also can enjoy a two-course lunch at Kensington’s Restaurant, along with use of the spa’s fitness center, sauna, steam room, whirlpool, indoor pool, and relaxation room, among other amenities. Which shall it be—a facial, body wrap, or a massage? Can’t pick just one? Well, with the ReNew You package, clients can experience any two of the 50-minute services. The package also includes one wellness class, a two-course lunch, and use of the spa’s facilities. Whether it’s combined with an overnight stay or enjoyed as a daytime getaway, a visit to the spa at Water’s Edge Resort is worth the trip. The spa’s Seaside Escape Package offers 50 minutes each of a hydrating bliss wrap, Swedish massage, and spa pedicure, in addition to a $25 food and drink voucher. The body wrap begins with a light exfoliation, then application of mud, clay, or seaweed before a self-heating blanket is applied. While wrapped, clients will experience a head and scalp massage before ending with a 25-minute body massage.